Got an e-mail from the DNR with the 2017 statistics for lakes fished last year. Had some on the east side complaining about lakes getting over here getting overfished. 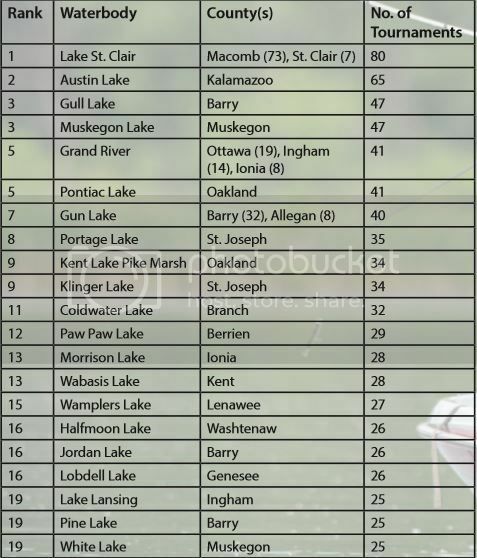 Turns out only 2 lakes not counting St Clair are in the top 15. Austin lake near Kalamazoo was the leader with 65. We have a lot of events over here but we also have a lot of lakes. Looks like 25 events per lake were where this list stopped. Either that or guys up there don't enter events on the DNR site. Wamplers is a pretty good-sized lake. Primarily I would guess it is popular because it has both really nice largemouth and really nice smallmouth bass! The handful of times I've fished it we caught some really nice bass. I hope we can get the weed treatments there moderated a little from what I've been hearing. There's not enough people in the Northern part of the state to add up to a ton of bass tournaments. You probably don't have many events after a certain point in September either (cold I think?). There's a LOT of people in the Southern part of the state. And yes, SE Michigan is blessed with water through many parts! I say this while living in the 'desert of Michigan' (Lansing). - the only reason Lake Lansing makes the list is because a shortage of choices around here! I'm trying to figure out where the "Kent Lake Pike Marsh" water is located?? There's no doubt the bass anglers is SW and West Michigan are tournament-aholics! They fish lot's of bass tournaments over there and it does seem like they have limited waters though there are other lakes smaller groups could fish more but they aren't as good in the summer as they are in the spring or fall, or the ramps are on the small side. Plus, there are a few lakes over there that now have 'local' bass tournament rules that make it a little less enjoyable for organized fishing.